Ships within 7 business days. Please allow up to 2 additional weeks transit time for your item to arrive. This timeless dining chair is the perfect fit for any home from modern city loft to rustic country lodge. Whether flanking a grand dining room table or tucked in a quaint breakfast nook, the supply cushioned chair provides a touch of elegance and a comfortable seat for family and guests alike. Sleek, black, top-grain leather upholstery with a hand-aged finish gives a ruggedly refined appeal to the piece. 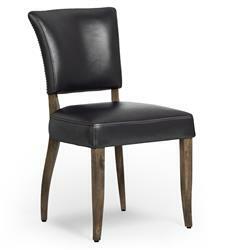 Gracefully curved legs in a weathered oak finish add to the chair's luxurious, masculine air. Rounding out the design, an antiqued gold nail head trim along the gently arched seatback brings a touch of sophistication and glitz to the versatile chair.